Kyoto Kimono Gakuin Kyoto Honko is a kimono school with a long tradition and history. We specialize in teaching dressing methods (“kitsuke”) for kimono as well as jūnihitoe and other Japanese royal costumes. 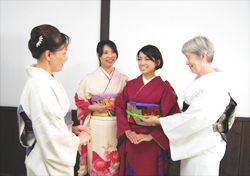 Conveniently located in Kyoto City in a traditional Kyoto machiya (wooden townhouse), visitors to our school enjoy unique and authentic kimono experiences with the help of our professionally trained kitsuke instructors and kimono dressers. Inquiries and reservations are accepted by phone from 9:00 to 18:00. We also accept inquiries and reservations by e-mail. * We are closed on Japanese holidays. 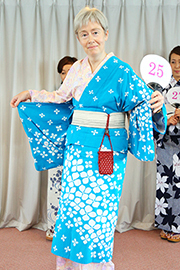 Dress yourself in kimono, dress others in kimono, learn omotenashi in Kyoto! We have prepared three customized “One Day Lessons” for you to enjoy!Select your preferred lesson. Dress your significant other, friend, or family member! Experience dressing another person in kimono (women’s or men’s). In Japan “omotenashi” refers to the art of hospitality and service. What is the Omotenashi Kimono Experience? Wear a silk kimono and experience kimono culture! Step 1. Wear a silk kimono! Most kimono rental experiences do not offer silk kimono, but in this experience you will choose an authentic silk kimono to wear. A professional kimono dresser will dress you. Choose your favorite kimono from our selection. Silk is cool in the summer and warm in the winter. It is a special, luxurious fabric that is smooth to the touch and has a long history here in Japan. Experience Japanese culture firsthand by wearing a real silk kimono! Step 2. Experience Japanese culture! Learn about the history of kimono and the unique colors and traditional motifs of Japan. Experience Japanese etiquette and how to move beautifully in kimono. Add an optional “Matcha Green Tea Experience” to your lesson! 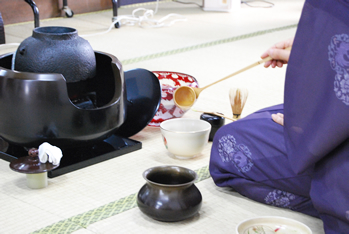 Learn the authentic method for preparing matcha green tea like in the tea ceremony. It will be a special memory of your visit and, with the growing popularity of matcha world-wide, a skill you can bring home with you! 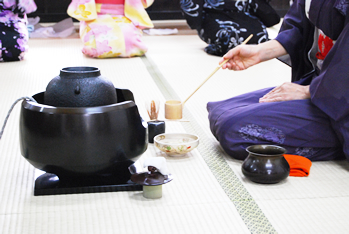 Add the Matcha Green Tea Experience to your lesson for 1,000 yen (+tax) per person. * An 8% sales tax will be added to all listed prices. ** One Day Lessons are held indoors so you can enjoy kimono regardless of the season or weather. Please note that these lessons do not include an option for going outside in kimono. © 2019 京都きもの学院 京都本校 All Rights Reserved.